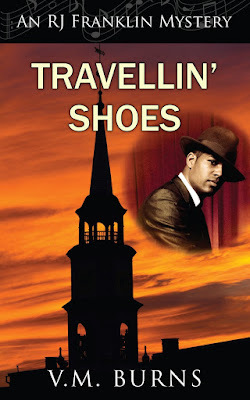 Today we’re joined by Detective RJ Franklin from the RJ Franklin Mystery Series by author V.M. Burns. I was a cop with the St. Joseph, Indiana police force. I was recovering from an accident, so I was out on medical leave. When the choir director at my church was murdered, I was called in to investigate. My doctor thinks I’m physically able to return to work, but I’m not so sure if I’m emotionally ready. I like the fact that I’m neat and organized. A lot of people assume a single man would be messy, however I like everything to be neat and tidy. Some people might say it’s a control thing, but I disagree. Cops are the first ones to arrive at the scene of a crime. We see the worse side of humanity. I’ve always been able to do my job and not allow it to get to me. I put up a barrier to protect myself, but after my accident, my barrier got a huge crack. Now, I’m not able to sleep and I find myself questioning why God would allow so many horrible things to happen. I was raised in the church. My faith was just a part of my composition. My author calls it a crisis of faith, but to me it’s bigger than that. I don’t like having these questions and not knowing what’s real and what’s right. What is the strangest thing your author has had you do or had happen to you? The strangest thing my author has had me do involves agreeing to teach a class at the law school. I don’t know what she was thinking, but I nearly puked the first time I had to go to testify in court. Public speaking is not my thing. I think she needs to rethink this. I often argue with my author. She is constantly trying to stretch me outside of my comfort zone, like how she wants me to teach at the University. I’m not a lawyer or PhD. I’m just a simple cop. No one, especially law students, are going to want to listen to me talk about law enforcement, but my author disagrees. My greatest fear is not being able to protect the people I love, like my godmother. Mama B lives in a dangerous area. There are gang bangers and street thugs around all the time. Unfortunately, I can’t convince her that they’re dangerous and maybe she should lock her doors and stop feeding them sweet potato pie and sweet tea. So far none of them have harmed her. In fact, they seem to have adopted her as their surrogate godmother and have pledged protection for her, but I don’t trust criminals. I don’t trust a lot of people, so I can’t help worrying about her. Spending time with the people I love, like my godmother, Mama B, makes me happy. I’ve also met a girl named Paris. Hanging out with her and listening to jazz makes me happy. If I could rewrite part of my story (or have my author rewrite it) I would have avoided the accident. It wasn’t my fault, but I can’t unsee what happened. I don’t know if I can ever get that image out of my head. I want to go back to a time when I slept at night, when children were safe and when I believed that I could make a difference. If I could trade places with anyone in Travellin’ Shoes, I’d trade places with my pastor, Reverend Hilton V. Hamilton. He is kind and very sure of his beliefs. I’d love to have that confidence again. Like me, V.M. Burns was born and raised in Northwestern Indiana. Although, she doesn’t like the cold and has moved to Eastern Tennessee. She writes two other mystery series, The Mystery Bookshop Mystery series and the Dog Club Mystery Series. She loves poodles and owns two. Readers can learn more about her at her website. www.vmburns.com. I’m going to continue solving crimes and catching bad guys. I’m also going to spend more time with my godmother, Mama B, and Paris. Readers can learn more in Motherless Child, which will release in 2019. When First Baptist Church's choir director is bludgeoned, shot and set afire, Detective RJ Franklin is called in to catch the killer. However, it isn't long before RJ realizes nothing is as it seems. In fact, not even the victim is who he claimed to be. Concerned for his church family RJ digs into the investigation even though he's still recovering from a car accident that has left him more shaken than he's willing to admit. Can RJ put his doubts behind him and find a killer before someone he cares about becomes the next victim? RJ, I agree with your author. I think you have lots of first-hand experiences, and you would keep your class mesmerized with the details. Thanks for the interview.